Solidarity, my friend—you are not alone. As a member of the Church of Seasonal Laziness (or just year-round laziness in general), I am a big fan of the slow cooker for those same reasons. If you haven't already harnessed its amazing versatility in the kitchen because you think your meals will be relegated to soups and stews, then you'll be pleasantly surprised by this awesome recipe hack by Paula Disbrowe of Food52. 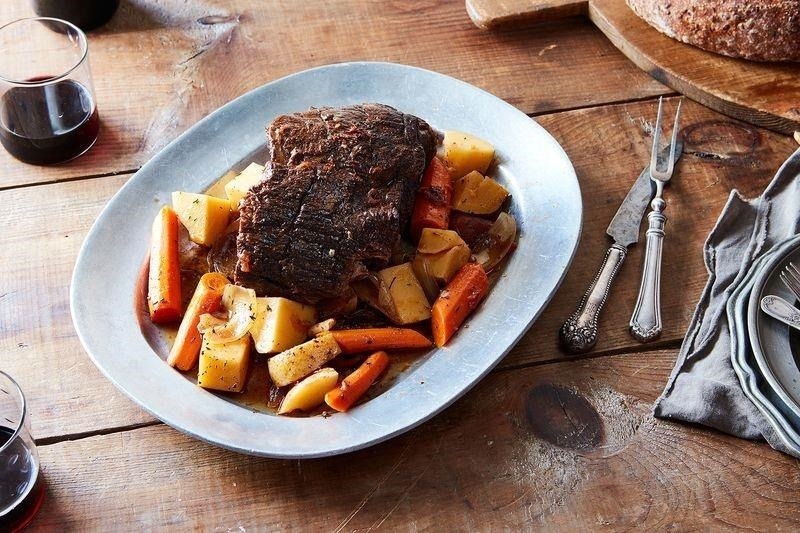 Her recipe for pot roast was already drool-worthy on its own—coffee and whiskey pot roast? Hell yes! But now that she's included a way to make it in the slow cooker as well, it's become a must-try recipe for the season. The best part about her alterations is that they can be used for any pot roast recipe, whether you choose to follow her excellent version or you have a favorite of your own (that your Great Aunt Muriel bequeathed to you at the annual Thanksgiving potluck). Brown the meat on the stove first for increased depth of flavor. No need to cook it through—just make the meat brown on all sides, then remove from heat. Take any of the veggies you plan on including with your pot roast and stir them around in the pan you used to brown your meat. Gotta absorb those tasty meat juices! Pour the veggies into the bottom of the slow cooker, place the meat atop the vegetables, then pour in some beef broth (and in this case, a small amount of whiskey and coffee powder) until the liquid comes halfway up the roast. Set the slow cooker on low for 8 hours, then prepare to eat the laziest but most rewarding pot roast of your life. Check out the full post with the specific recipe here (it also includes a sweet breakdown of the different types of beef cuts you can and should use courtesy of Beef Checkoff). Got any other lazy but awesome tips for using a slow cooker? Share them with us in the comments below.